The day I turned 16, I got my driver’s license and my mom handed me the keys to my new (used) baby blue 1970 Toyota Celica hatchback–the keys to my freedom. It felt like my biggest achievement… especially after waiting for hours to take my written and driving test, my photo, my eye test and my thumbprint, which they still did back in the 80’s. The thing I remember most about that day at the Los Angeles DMV? Sitting alongside dozens of other (not-so-happy) people in the waiting room in hard chairs lined up in several rows as far as the eye could see. Pattern matching is the way our brain responds to any visual stimulus. The way it works is when we see something new, our brain will try to associate it with something we’ve experienced in our past. And it influences our emotions, both positively and negatively. This gets me to the point of my note to you today. When you are designing or redesigning the waiting room in your practice or clinic, consider comfortable upholstered furniture—like a medium-firm cushioned sofa and chairs with arms—over hard chairs that are lined up like rows of army cadets waiting to take orders from their general. Your new furniture doesn’t have to be expensive, and the size depends on how many people you need to accommodate in the room at one time. When your patients walk into your waiting room and are greeted by comfortable upholstered furniture, there is an instant pattern matching to positive feelings associated with being home. Home represents safety and nurturing for so many of us. It is the place where we can let down our guard and feel protected from outside influences. Your comfortable upholstered furniture helps to create a healing environment where your patients can relax and feel supported by you. In fact, in patient surveys people overwhelming want to eliminate the institutional experience in healthcare spaces. Your waiting room (when designed appropriately) can reduce your patients’ anxiety and fear about working with you, your colleagues and your staff. Want more design inspiration for your waiting room now? 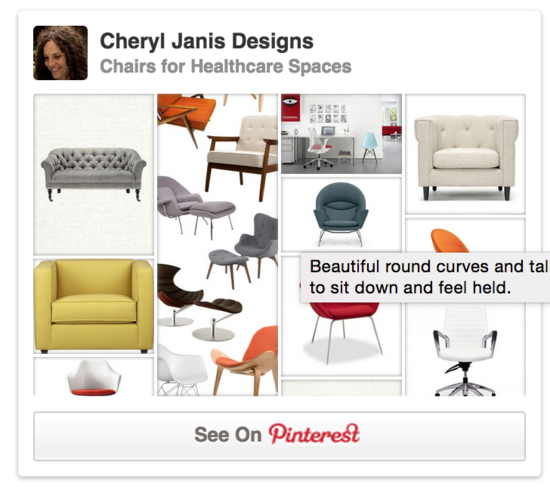 Head on over to my Pinterest board, “Chairs for Healthcare Spaces.” I created it just for you. Or click on the pretty photo below and you’ll be there in a snap. See you next time, when I share more easy digestible prescriptions for your healthcare practice. In the meantime, enjoy this day!